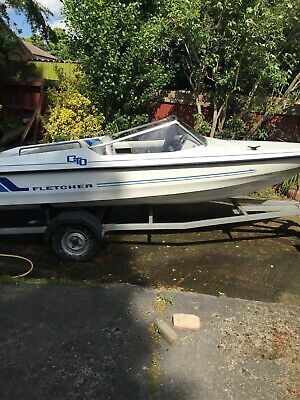 We are selling our Fletcher Arrowstreak Family Speedboat due to upgrading. We have owned the boat for 2.5 years and have had many lovely days out off the Dorset coast. Since we have owned the boat we have had the bellows and gimble bearing replaced, a new automatic fire extinguisher installed and last season had a new battery and alternator fitted. The boat ran with no issues last season. The hull is in good condition for the age but there are some minor scuffs as seen in the pictures. The seats as you can see from the pictures could do with being re-upholstered which we had planned to do but just didn’t get round to sorting. It is fitted with a stainless steel quicksilver propeller. The trailer is solid but has had it’s brakes removed. The boat is to be sold as seen with no returns. Any queries please send us a message. 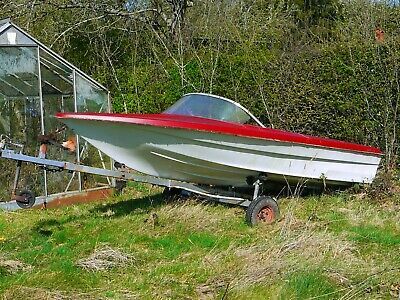 Fletcher arrow 1990 shell / project boat for sale lying in Doncaster. This sports boat is a classic, 13 foot / 4m. All body work has been primed. She comes with the trailer pictured. I don’t have time to finish this project. Please note this is just the hull / shell, no engine / fixtures or fittings. (Trailer included). 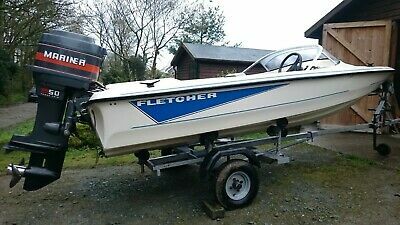 Hi here I have my fletcher boat. Have owned this boat a while now has never let me down. Recently had it up and running with no faults. This boat can pull to skiers behind it easily. It has a mercury engine of 115hp. The trailer is included and was repaired end of last summer as was rotting away. This boat is a great family boat. This boat Also Has a built in CD player with speakers Any viewings welcome. Comes with cover. Your bidding to buy. Cash on collection. Only reason for the sale of this is I’m going back to a jet ski. Beautiful Fercher GTO speedboat. Fantastic original condition with fully refurbished interior. 70hp Evinrude outboard which runs perfect and pumps water as it should ( ex RNLI ) so serviced regular. This is a fast fun boat that has been maintained to a very high standard regardless of cost. Comes with lots of accessories including 2 inflatable toys for towing fun. Complete set up including fuel tanks / boat cover etc More photos on request. Very reluctant sale and only selling due to ill health. Fletcher 13 arrowsprint rare center seat, I believed these were made on the 70’s for ski racing and originally had a back to back seat, there is only one seat fixed to the boat but the second seat is included in the sale as seen in last photo. *this would require brackets / subframe to fix to boat. It’s a great lightweight boat, which can be towed with smaller vehicle and is easy to launch and retrieve. The engine is a 1982 50hp 4 cylinder mariner outboard electric start and has power trim / tilt. The engine is in good condition with stainless solas propeller, was running good last year when last used (will upload video of engine running when I get a chance to film during the next few days) A new floor and carpet has recently been fitted and the tyres and wheels are relatively new. The hull has original gellcoat and decals, there’s a few scratches and chips and windscreen is crazed. Things that require attention: Black speedometer is not connected Electronic choke solenoid is missing linkage but choke can be operated manually on outboard. The outboard steering is seized on the pivot, I have tried greasing but may need stripping and cleaning, the teliflex cable is ok as it’s moving freely. The trailer requires tlc I was hoping to replace but should be ok to tow carefully. Viewings welcome, any questions please feel free to message me. Many thanks for looking On 21-Mar-19 at 18:44:04 GMT, seller added the following information: Started the engine up today for the first time this year, please find a link below to a video of it running : https://youtu.be/OPwdIa_9-sU For info the bottom carb was leaking a bit but seemed to stop once started. 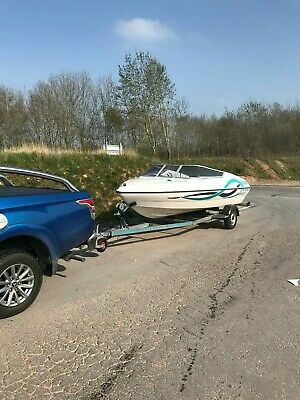 Comments Off on Fletcher 155 Gto Speed Boat With Mariner 60hp Outboard And Trailer. 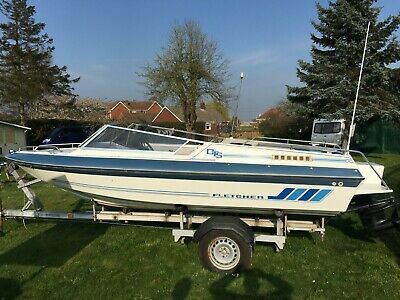 Fletcher 155 Gto Speed Boat With Mariner 60hp Outboard And Trailer. 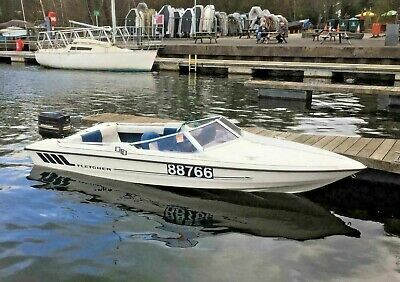 Steve The Maniac swapper offers deals up or down American Power SPEED Boat BMW M TEC mercecruiser 3.0 lrt inboard with stern drive power tilt .NEW BATTERIES.ENGINE RECONDITIONED.DRIVE LEG RECONDITIONED. loads of spare parts NEW TYRES AND BEARINGS FITTED TO TWIN AXLE BRAKED RECONDITIONED TRAILER.NEW FLOOR .SEATS REFURBED.LOADS OF HISTORY IN A FOLDER.ALL WORKSHOP MANUALS.PROP REFURBED PLUS SPARE PROP AND PROFILED.STARTS FIRST TIME IN THE BUTTON.INBOARD FUEL TANK.NEW HEAVY DUTY BATTERY/THOUSANDS SPENT BMW MERCRUISER MOTOR CONTACT STEVE ON 01737821177 WITH DEALS OR SEND PHOTOS OF SWAPS TO [email protected] Fletcher Arrowbeau BMW edition. Far better boat than a Shakespeare.Very Rare genuine BMW POWERED GTB ( GTS Arrowbeau ) Fletcher 18? Power Boat. BMW took a handful of the Fletcher GTS’s in the early 90s and fully converted them into a MSport BMW Engine Powered Speed Boat. Im not sure how many are left but I have struggled to find any. The engine & Leg is BMW as you can see in the photos. The BMW inboard engine has 190 bhp and goes like a rocket at 55mph once on the plane . It has a heat exchanger flush chamber. Engine starts on the button and sounds awesome. I have previously owned mercruiser inboards and this BMW is much better. I regularly started The interior was fitted out in MSport upholstery and stripes by BMW as is the BMW dashboard clocks. She comes with an excellent twin axle breakback Galvanised Trailer worth £2000 and has just had new bearings and tyres. Bilge pump fitted, Standard Nav Lights, new battery just fitted.Huge rear sundeck for 2 people to sunbathe . Comes with anchor and rope. She has a front internal fuel tank £50 to fill and is amazingly cheap to run. As you can see from photos she has a cover but even though its ok i would get a new one made so she looks better. Interior and carpet in all round good condition , front seats could do with slight re upholstery eventually as the head rests are taped up.. Diving platform is great and very easy to get back on stainless rear drop down ladder . Any viewings welcome by appointment as she is stored at a my yard in redhill surrey . . 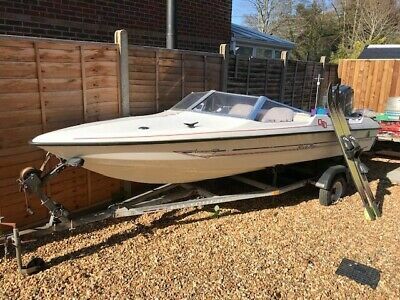 Grab yourself a Rare opportunity to purchase this BMW MSport Speed Boat. 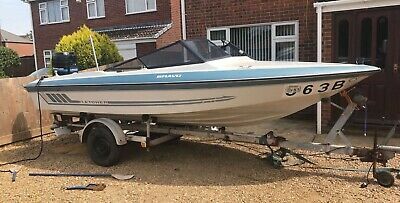 Fletcher Speed Boat and trailerArrowsport Black Max 15 ft fibreglass hull in very good condition. 75HP Mariner Outboard with power tilt and trim. Electric start (very quick boat with this size engine!) New 2 stroke auto lubrication oil pipes, have a video of it running and going up and down. Boat dash board and seats will need refurbishing. Needs a whole new steering setup as the worm gear and steering wheel boss have corroded and died. 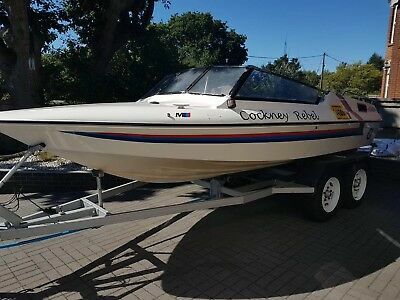 Ideal for water skiing and wake boarding (includes boarding ladder and ski pole).Integrated bow fuel tank and electric bilge pump.Also includes Water Skis, doughnut, various life vests and wetsuits.Trailer includes manual winch and light board. Axle is corroded and will need repair/replacing. One tyre has a slow puncture. (Would recommend collecting with another trailer or flat bed as I wouldn’t trust towing this one). The main trailer itself is in great condition, it’s just the axle and boat props that’s are heavily corroded, easily replaced!Many hours of fun had with this great little boat, sadly its not being used as much as it should so its time for someone else to enjoy, will be very sad to see it go as we have spent many of years down at the beach and nipping across to the isle of white. Any questions then please do let me know. Boat location is in Camberley, Surrey. Viewing is avalible!